For a while now we've been trying to figure out how we can pull all the Phidias Gold followers/artists together. Bringing together the existing family of PG supporters. What we've come up with is trying to build some sort of community. 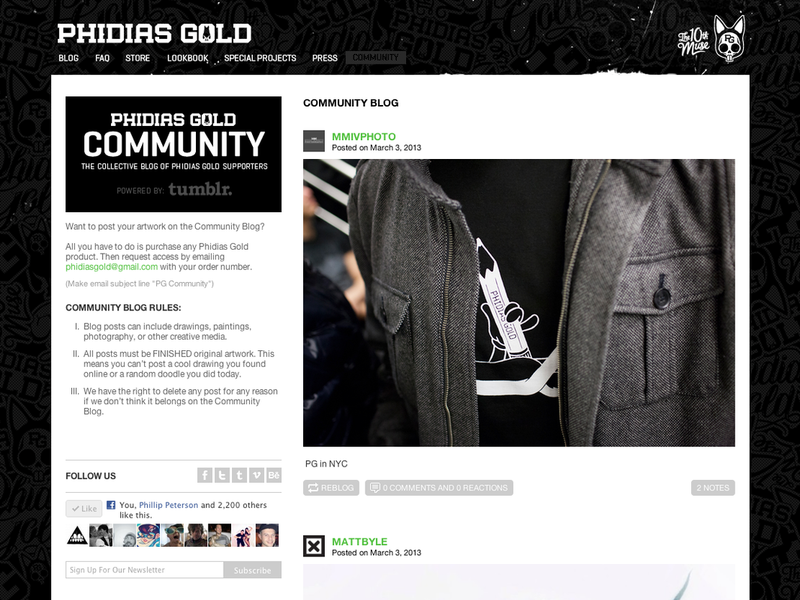 Letting artists share their work and interact with each through the Phidias Gold network we are constantly working to build. Ideally we would like something as clean and simple as the Mintees talk section but for now we are going to test it out with a collective blog (tumblr). Niice! Lost my order number though. Setup85 said: Niice! Lost my order number though. I got you.. just let me know what email you want the tumblr to link to and ill send you an invite. Sounds cool.. oh yeah, that resin figure came in a week or so ago... that thing is great man! Killer Napkins said: Sounds cool.. oh yeah, that resin figure came in a week or so ago... that thing is great man! Thanks, glad you like it. If you customize it make sure to send me some pics. I can find it and send you an invite! !